Since I am going to combine some Cloud Giant adventures and have a floating castle, I figure I should have at least one encounter with their land-dwelling cousins. Fog giants first appeared (well for me anyway) in the 1st Edition Fiend Folio. These creatures can be added to any giant-themed adventure. *Any group of 10 Fog Giants will include a Cloud Giant noble. From the 2nd Edition Monstrous Compendium. Cousins to the cloud giants, these large rock-hurlers are more intelligent and stealthy than portrayed in story or song. 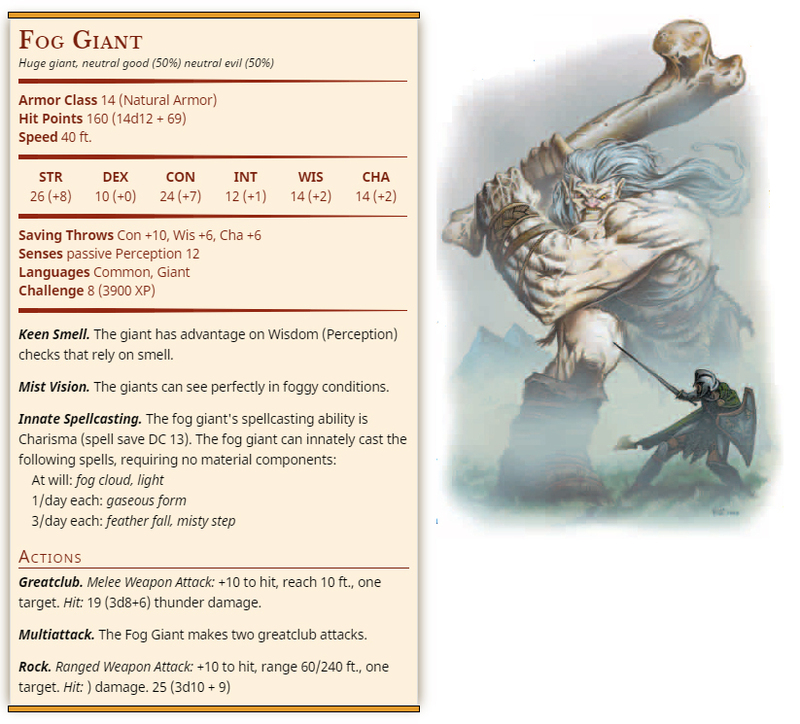 Fog giants are huge and husky, with tree-trunk sized legs, and over-developed arms muscled by constant throwing games and exercises. They have milk-white skin which aids their natural ability to blend into fog (80% chance). Their hair is silvery white and flowing, with ample hair on the arms, legs, and chest. They grow no facial hair whatsoever. They prefer to wear no armor, counting on their high natural Armor Class. They love massive, ornate clubs made from bleached and polished wood or bone. Fog giants are proud of their strength and fighting skills, often playing games when on hunting forays in an attempt to best one another. Their favorite such game is called “copsi” and consists of the giants pairing off to toss larger and larger boulders to their partners until one of the pairs misses its throw. The fog giant families live in caves, canyons, or thickets, in the most inaccessible areas of marsh, swamp, forest, or coast. The men usually hunt in groups, ranging up to a dozen miles from their homes. The groups generally are formed of giants of similar alignment. By tradition, a young giant may not mate until he has obtained at least one large ornament of silver. Usually, the young giant joins with several others in a quest to find one (or acquire enough treasure to buy one). Fog giants do not often mix well with other creatures or races, although they can often be persuaded to perform services for a fee, or barter goods with groups of similar alignment. Fog giants will happily barter goods and services for refined silver. Territorial disputes sometimes flare up between groups, especially in times of bad hunting. Friendly disputes can sometimes be resolved by a game of copsi or an arm-wrestling match. Fog giants fighting amongst themselves will generally throw rocks and fist-fight, rather than use swords. Fog giants are fond of all sorts of cooked meats, particularly hoofed creatures such as horses, cows, deer, elk, and centaur. They often cook meat by building a large fire, then impaling chunks of meat on their swords and holding them over the open flame. Fog giants prefer fruits and sweets for dessert, and will also down large quantities of spirits if available to them. They do not distill their own spirits or liquors. They also sometimes smoke fresh milkweed pods in wooden pipes, though the taste is too bitter for humans and demihumans to enjoy. I forgot these giants existed. I may add them to Storm King's Thunder.